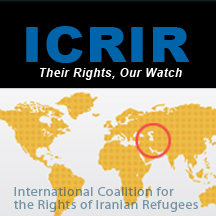 Deportation of Mohammad Sirvan Foroutan, an activist who has engaged in political and armed struggle against the Islamic Republic regime in Iran, is clearly illegal under international law. Yet despite a letter to the Swedish government by three members of Swedish Parliament, published in Aftonbladet today, repeated demonstrations against the deportation on Tuesday and this morning in Stockholm and Goteburg, and despite public opposition to this crime by the government of Sweden from people around the world, the Swedish government has shown no signs of stopping the illegal deportation. As of 1:00am CET on 6 May 2011, the date of Sirvan’s deportation, people are demonstrating outside the Migration office in Stockholm, and will be there through the night. Swedish National Television is covering the protest demonstration, and there have been slight confrontations with the police, though no no one has been arrested yet. A lawyer forced herself inside the compound at the Migration Office at 00:30am and got power of attorney for Sirvan, and has sworn to work on his case through the night to stop this illegal deportation. She will be there tomorrow at 9am participating in the larger demonstration. 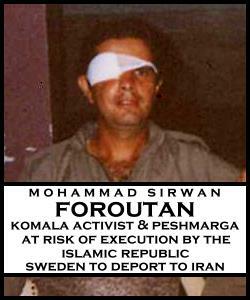 Activists have issued a call for people to join them in demonstration at 9am on 6 May 2011 outside the Migration Office in Stockholm, Solna – Pyramidvägen 2 A to stop Sweden’s deportation of Sirvan Foroutan. We urge all people with a possibility of joining in this demonstration to do so, and for people around the world to continue to pressure the Swedish government to stop this crime of deporting an activist to a regime that will with certainty execute him.